Equipment noise levels may be obtained from manufacturers, equipment tendering documents, or test results. 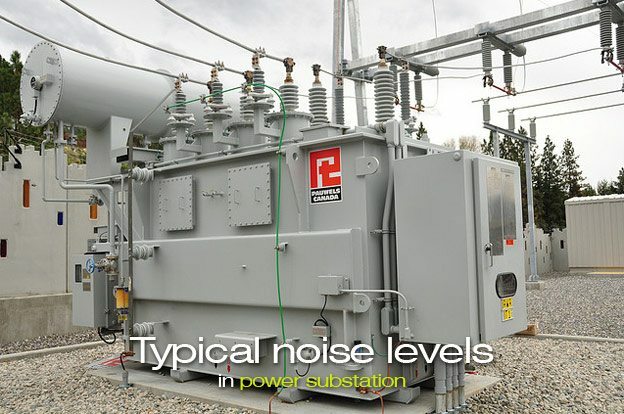 The noise level of a substation power transformer is a function of the MVA and BIL rating of the high voltage winding. These transformers typically generate a noise level ranging from 60 to 80 dBA. Transformer noise will ‘transmit’ and attenuate at different rates depending on the transformer size, voltage rating, and design. Few complaints from nearby residents are typically received concerning substations with transformers of less than 10 MVA capacity, except in urban areas with little or no buffers. Complaints are more common at substations with transformer sizes of 20 – 150 MVA, especially within the first 170–200 m (500–600 ft). However, in very quiet rural areas where the nighttime ambient can reach 20–25 dBA, the noise from the transformers of this size can be audible at distances of 305 m (1000 ft) or more. In urban areas, substations at 345 kV and above rarely have many complaints because of the large parcels of land on which they are usually constructed. The rate of attenuation of noise varies with distance for different types of sound sources depending on their characteristics. Point sound sources that radiate equally in all directions will decrease at a rate of 6 dB for each doubling of distance. Cylindrical sources vibrating uniformly in a radial direction will act like long source lines and the sound pressure will drop 3 dB for each doubling of distance. Flat planar surfaces will produce a sound wave with all parts of the wave tracking in the same direction (zero divergence). Hence, there will be no decay of the pressure level due to distance only. The designer must first identify the characteristics of the source before proceeding with a design that will take into account the effect of distance. A transformer will exhibit combinations of all of the above sound sources, depending on the distance and location of the observation point. Because of its height and width, which can be one or more wavelengths, and its nonuniform configuration, the sound pressure waves will have directional characteristics with very complex patterns. Close to the transformer (near field), these vibrations will result in lobes with variable pressure levels. Further from the transformer (far field), the noise will attenuate in a manner similar to the noise emitted from a point source. The attenuation is approximately equal to 6 dB for every doubling of the distance. In addition, if a second adjacent transformer produces an identical noise level to the existing transformer (e.g., 75 dBA), the total sound will be 78 dBA for a net increase of only 3 dB. This is due to the logarithmic effect associated with a combination of noise sources.